An extension to WooCommerce enabling site owners to add or use Custom Post Types as products. This plugin is the same as WooCommerce WooRei Shop Manager, just renamed and improved. When activated, you will now be able to set custom post types as WooCoommerce products. Just visit the Dashboard and then navigate to WooCommerce > Settings > Products > Custom Post Types. Once your Custom Post Type (CPT) is set, you will then be able to add post to your CPT the same as how you add products. Your CPT will still have it’s own menu. Nothing will be changed. The only change you’ll get is that on add/edit screen of your post type, you will have woocommerce meta box. This meta box is for the product prices, settings, etc. This plugin does not have the ability to add/create CPTs. You can add your CPTs in any way you want it. If your theme does not have the CPT and you want to create one, I recommend using this plugin called “Custom Post Type Ui”. 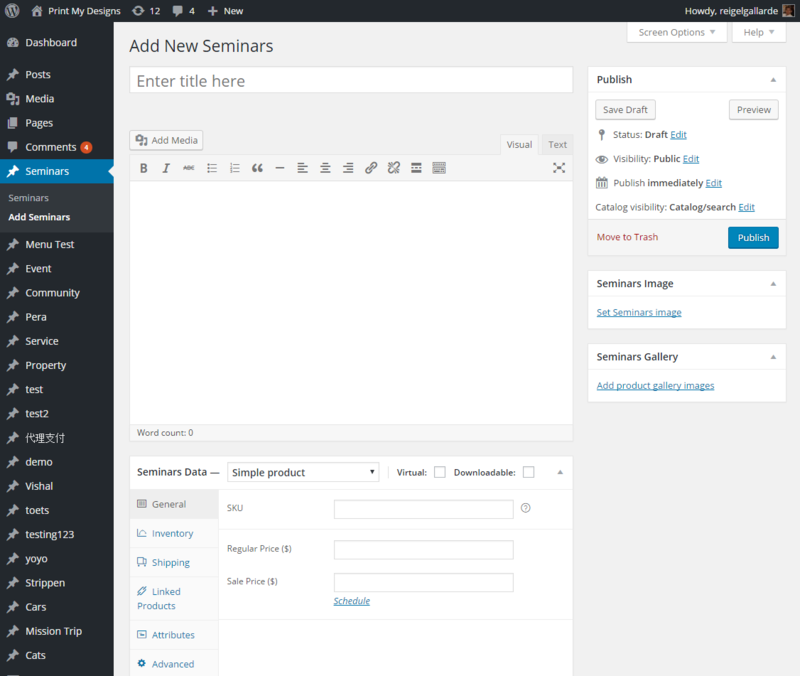 Custom Post Type Ui plugin is available for free on the wordpress.org plugins repository. Once you have the plugin, you need to upload it to your site and activate it. You can follow instructions on Installing Plugins if you’re unsure how to install a WordPress plugin. After you activate the plugin, navigate to WooCommerce > Settings > Products > Custom Post Types. Click Settings on the right side of your CPT. Set the appropriate settings and then click Save changes button to take effect. Adding New CPT, you will now have a screen similar to this image below. added ability to change theme built custom post type to adopt to woocommerce. change: files changed. Refactored the codes without affecting functionalities. change: renamed from “WooCommerce WooRei Shop Manager” to “WooCommerce Custom Post Type Manager”. fix: removed/fixed all notices and errors that are visible when WP_DEBUG is true. change: added support from previous version, this plugin can still use CPT created from “WooCommerce WooRei Shop Manager”. This plugin is not fully 100% plug and play. If you plan to just follow the instructions above, you will end up having a product page just like woocommerce (in terms of style). You might have another style in your mind. If that’s the case, you can use your own style but you need to program or code the html yourself. HTML code for quantity and add to cart buttons. Nevertheless, if you know what you’re doing you can always get there. I can always help you (but not free). Below are some of the known issues. There are maybe other unknown issues. Shop page sorting of items of CPT not working. Shop page nav/page current menu item class missing. Revoking download permission in the order will not let you add the permission again. Updating from older version to version 1.0 will give errors, quick fix is to set the CPT again in WooCommerce > Settings > Products > Custom Post Type.